Amid the United States’ ongoing opioid crisis, government agencies are documenting the rise of another highly addictive drug: methamphetamine. Data from the U.S. Centers for Disease Control and Prevention shows that from 2010 to 2014, the number of drug overdose deaths involving methamphetamine more than doubled, jumping from around 1,400 to nearly 4,000 (opioid-related overdose deaths, at 28,647 in 2014, have overshadowed these numbers). The U.S. Drug Enforcement Administration’s 2017 National Drug Threat Assessment suggests that methamphetamine availability is high in the U.S., with many states reporting greater availability since 2013. The DEA substantiated these reports using purity (the amount of methamphetamine present compared to other substances), potency (how much of the drug is needed to have an effect) and price data. The price of methamphetamine per gram has decreased (it stood at around $58 in September 2016) as its purity has increased. Nearly 30 percent of agencies responding to the DEA’s 2017 National Drug Threat Survey said that methamphetamine was the greatest drug threat in their areas. Thirty-six percent reported it is the drug that most contributes to violent crime. In light of these trends, Journalist’s Resource collected recent research and resources to answer questions reporters new to the topic might have. Methamphetamine is a synthetic drug, which means it’s made in a lab, not grown in a field like marijuana or opium poppies. Producing meth thus depends on the availability of the ingredients needed to create it, also called precursors, including ephedrine, pseudoephedrine, and phenyl-2-proponone (P2P). These first two ingredients might ring a bell from trips to the pharmacy. Pseudophedrine is a decongestant used to alleviate cold and allergy symptoms. Ephedrine was commonly used in weight-loss products. Dietary ephedrine products were banned by the FDA in 2004, but the drug is available over the counter for some conditions, like asthma. P2P is a schedule II controlled substance not commonly available in consumer products. The household availability of some meth precursors, though, fostered small, domestic laboratory operations in the early 2000s. These restrictions might also drive manufacturers to synthesize meth with other ingredients. Much of the methamphetamine found in the U.S. today is produced in Mexico using phenyl-2-proponone and trafficked across the border, according to the DEA’s report. This reflects a broader decline of domestic production of methamphetamine since the passage of CMEA and an increase in international production. Domestically, however, conversion laboratories are popping up, particularly in California. These labs transform smuggled methamphetamine into a saleable product. What are some of the effects of the resurgence of methamphetamine? Methamphetamine has been linked to a number of health risks, including hepatitis C infection, stroke, psychosis and other forms of psychological distress. A longitudinal study of 278 people who were dependent on methamphetamine but not schizophrenic or manic, published in Addiction in 2014, found that violent behavior increased after subjects used methamphetamine. Methamphetamine users also face a higher risk of death than people who use other drugs, including cannabis, cocaine and alcohol. 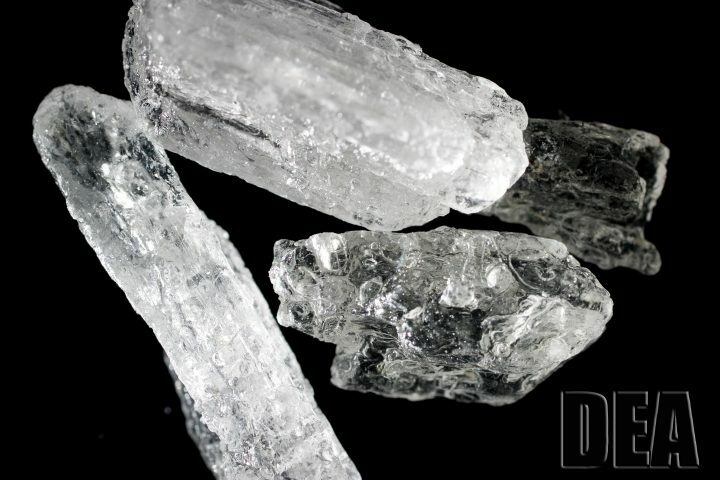 A study published in the American Journal on Addictions in 2014 suggests that certain social outcomes, including homelessness, drug dealing, being a victim of violence and prostitution are associated with crystal methamphetamine use. Research exploring connections between methamphetamine use and criminal behavior indicates that meth users “have more extensive criminal records and are more likely than other drug users to commit property crimes.” Kentucky Department of Corrections data indicates that the percentage of offenders who used methamphetamine in the 12 months before their incarceration has increased sharply over the past five years. In 2012, 23.5 percent of offenders in the state reported using illicit methamphetamine in the 12 months before their incarceration; by 2017, this figure was 43.9 percent. Are there treatments for methamphetamine addiction? A number of treatments exist for methamphetamine addiction, including cognitive behavioral therapy and other drug counseling and addiction support services. Unlike treatment for opioid misuse, there aren’t medications that specifically block the effects of or curb cravings for the drug. The National Institute on Drug Abuse (NIDA), run by the National Institutes of Health, funds and publishes research on methamphetamine and other drugs. The DEA summarized key findings related to methamphetamine from the report cited in this piece in a one-page document. Additional resources are available on the DEA’s website. The U.S. Sentencing Commission has a backgrounder on methamphetamine trafficking and a sourcebook of federal sentencing statistics that can be sorted by drug type. Journalist’s Resource has covered research and resources on other substances, including fentanyl, prescription opioids and marijuana.